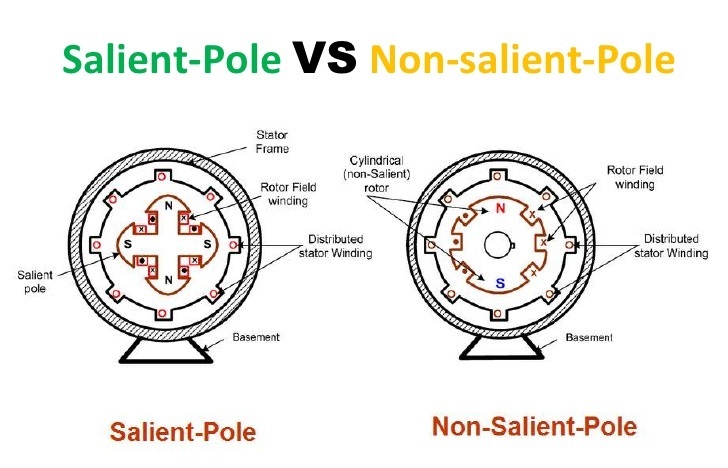 In salient pole type of rotor consist of large number of projected poles (salient poles) mounted on a magentic wheel.Construction of salient pole rotor is shown in the figure left . The projected pole are made up from laminations of steel .The rotor winding is provided on these poles and it is supported by pole shoes. salient pole rotor have large diameter axial length . They are generally used in lower speed electrical machines,say 100 RPM to 1500 RPM .As the rotor speed is lower ,more number of poles are required to attain the required frequency . (Ns=120f/P there fore ,f = Ns*p/120 ie frequency is proportional to number of poles).Typically number of salient poles is between 4 to 60. Flux distribution is relatively poor than non-salient pole rotor hence the generated emf wave form is not as good as cylindrical rotor . 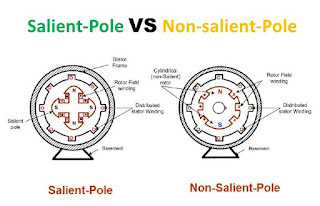 Salient pole rotors generally need damper winding to prevent rotor oscillations during operation. Salient pole synchronous generation are mostly used in hydro power plant. 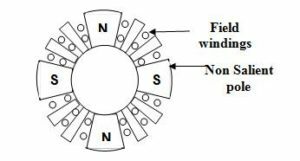 Non salient pole rotor are cylindrical in shape having parallel slots on it to place rotor winding. Its is made up of solid steel .The construction of non-salient pole rotor (cylindrical rotor) is shown in figure . Some time they are also called as drum rotor .They are smaller in diameter but having longer axial length .Cylindrical rotors are used in high speed electrical machines ,usually 1500 Rpm to 3000 RPM .Winding loss as well as noise is less as compared to salient pole rotors . 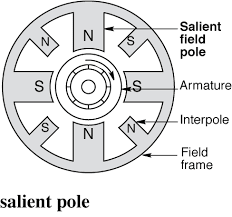 Their construction is robust as compared to salient pole rotors.number of poles is usually 2 or 4 .Damper windings are not needed in non salient pole rotors .Flux distribution is sinusoidal and hence gives better emf wave form. Non -salient pole rotors are used in nuclear ,gas and thermal power plants.